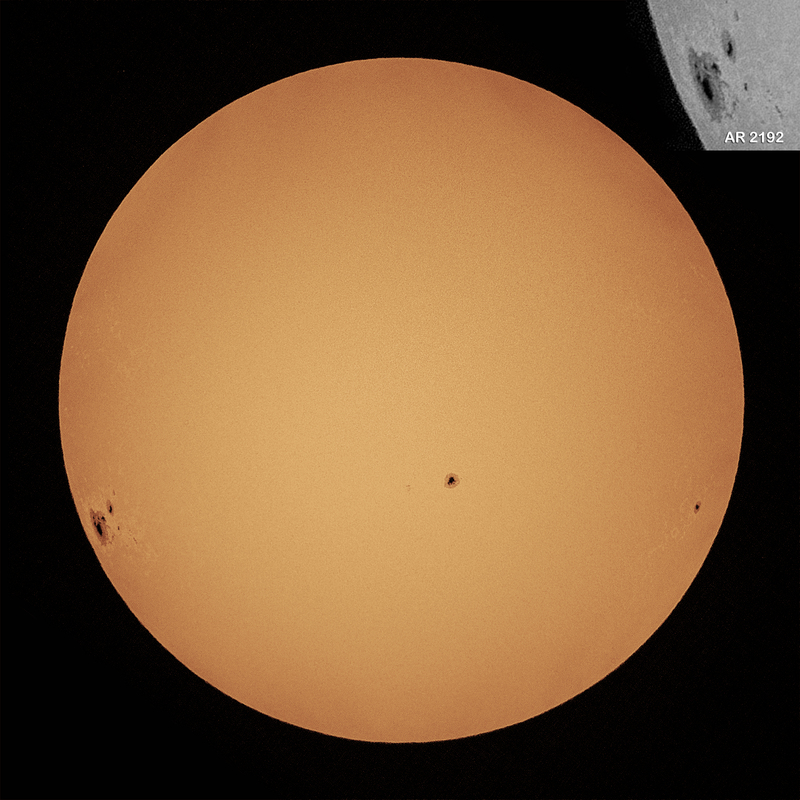 AR 2192 is the largest sunspot seen in the last 2 solar cycles (22 years). It produced a X 3.1 class flare today. Very difficult conditions between clouds and wind gusts. 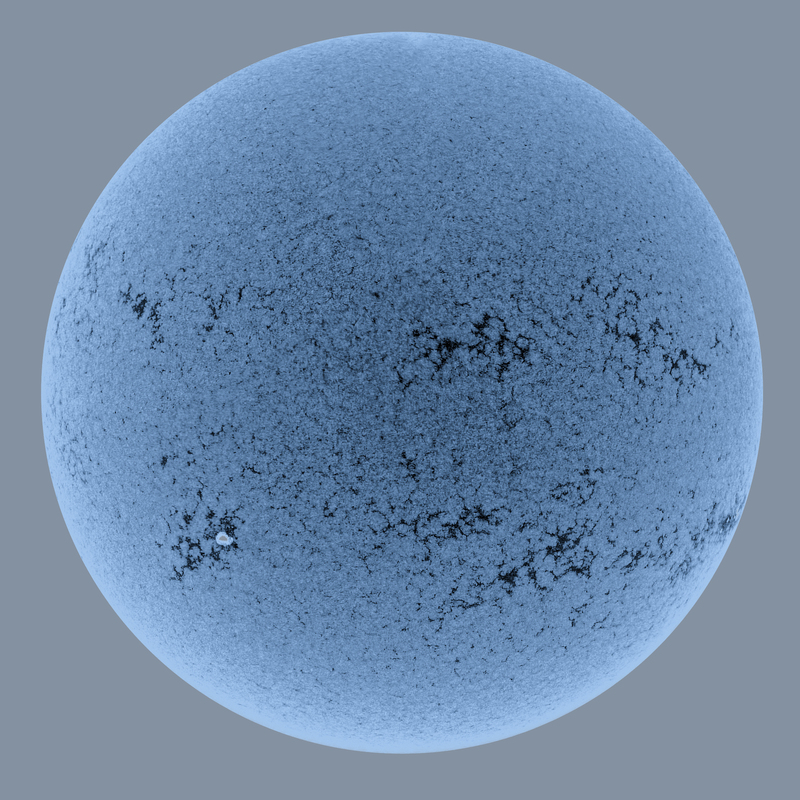 CaK imaging – well, least said the better but managed to get one fuzzy image of AR 2192 in ultraviolet at 393nm. LuntB1200 CaK module, Baader K-line filter and Skyris 274m. Baader Herschel wedge, Baader UV/IR cut filter and Skyris 274m. 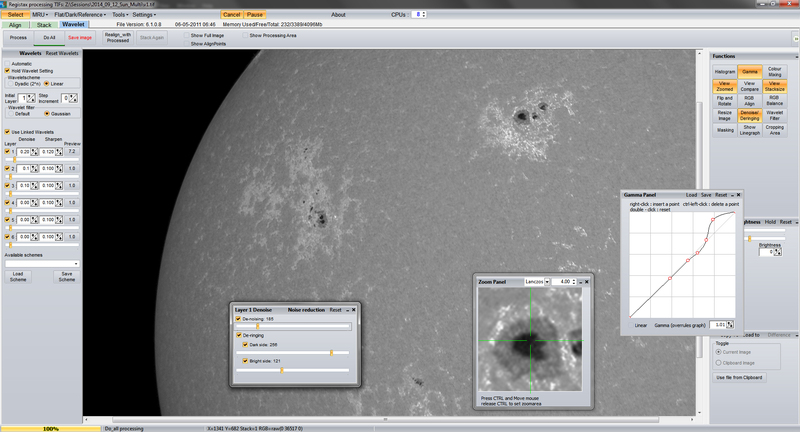 Was keen to image monster sunspot on Eastern limb but very windy here this morning. I thought setting up a long refractor and doing 2 minute long video runs wouldnt really work so I went back to basics and took this with a DSLR through a squat Nexstar 8SE with Baader safety film on the front end. The Nexstar won’t align on the Sun but I set it to Venus which seemed stable enough. 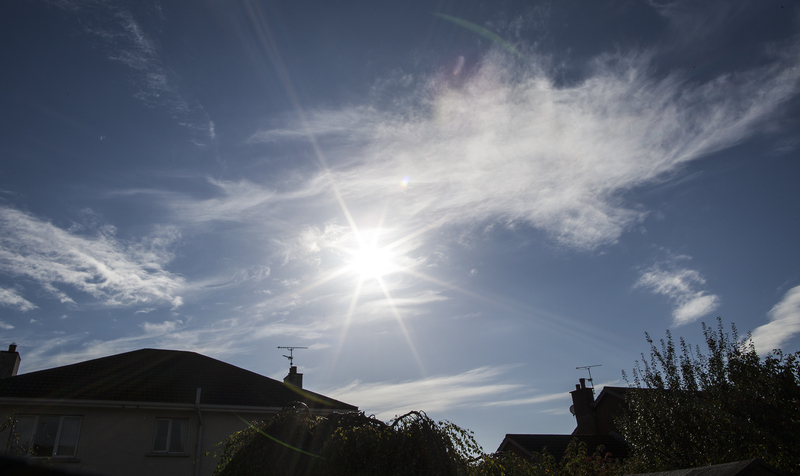 Canon 5D mark 2 ISO 100 at 1/640s. AR 2192 has already thrown off a couple of M class flares when it was far side. 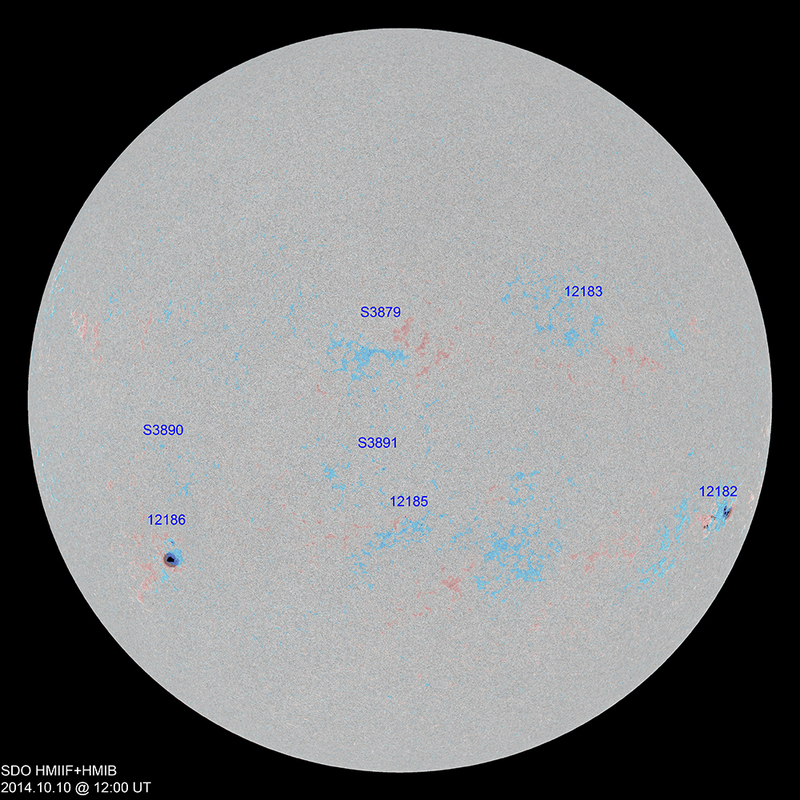 On 18/10/14, AR 2192 produced a M1.6 flare. 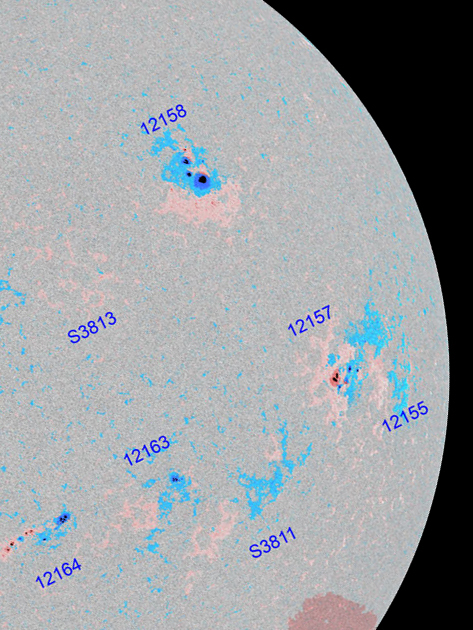 On 19/10/14, AR 2192 produced a X1.1 flare. 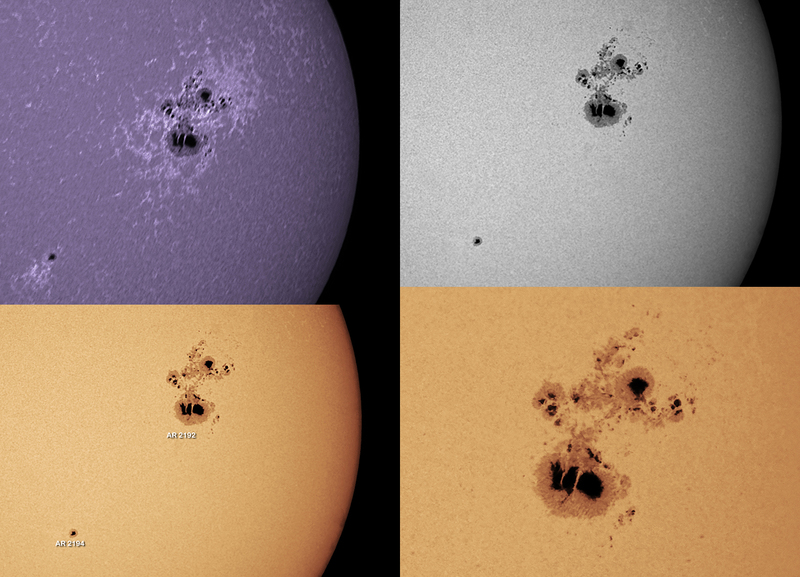 On 24/10/14, AR 2192 produced a X3.1 flare. A low-contrast web-like pattern most readily seen in hydrogen alpha or Calcium K outlining bundles of magnetic fields that concentrate around the edge of supergranulation cells. Supergranules are enormous clusters of ordinary granules with a diameter of about 30000km. Fluid motion within the supergranule concentrates magnetic fields at the edges. Source: Observing the Sun, A Pocket Field Guide. Jamey L Jenkins, Springer. 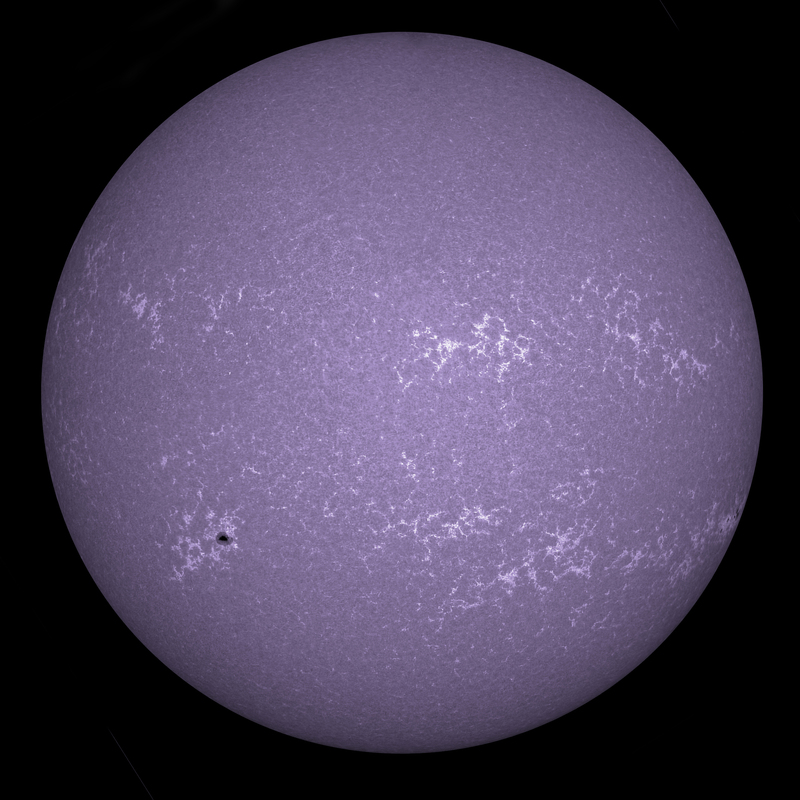 This is an “inverted” Calcium K image of the Sun on 12th September 2014 taken with a 1000/100mm refractor, Baader B1200 CaK module, Baader K-line filter and Skyris 274m CCD camera. A bright full moon tonight so I set up my 1000/100mm refractor. I thought the atmosphere was fairly bubbly so I didnt try any high powered views. 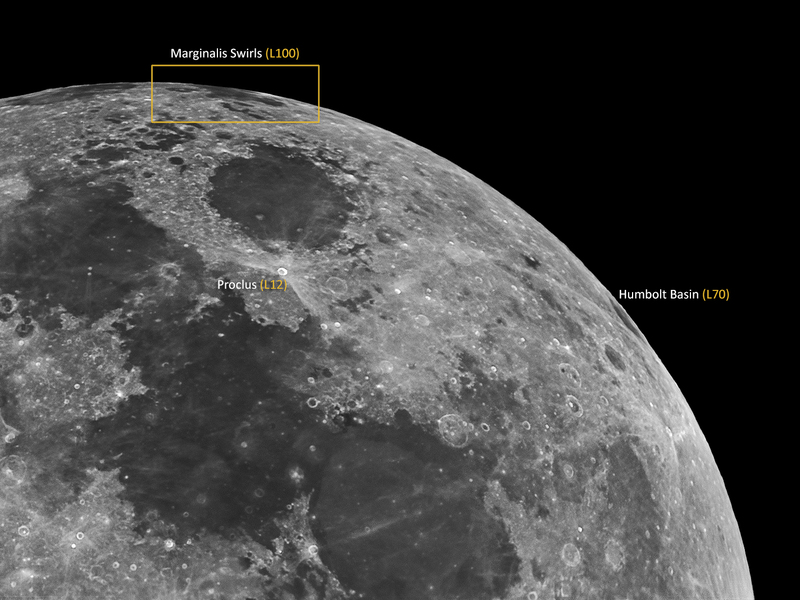 I just took one video around Mare Crisium and Proclus (L12), a crater with a bright ray system, like a protractor. It was only when I compared the final image against a moon atlas that I noticed right at the eastern limb, the multi-lobular appearance of Mare Marginalis, a lava-filled mare that can only be seen if the moon’s wobble (libration) permits. This is actually number 100 in Charles Wood’s Lunar 100 because it is rarely visible. This particular tilt also means that L70, the Humboldt basin is visible tonight. I think that brings me up to about 27/100 or so but it’s nice to tick off number 100. Day 14 moon, 100% disc. Celestron 1000/102 refractor on Ioptron ZEQ25GT mount. Skyris 274m CCD camera with Baader Red 2c filter. blue = N magnetic pole and pink = S magnetic pole. 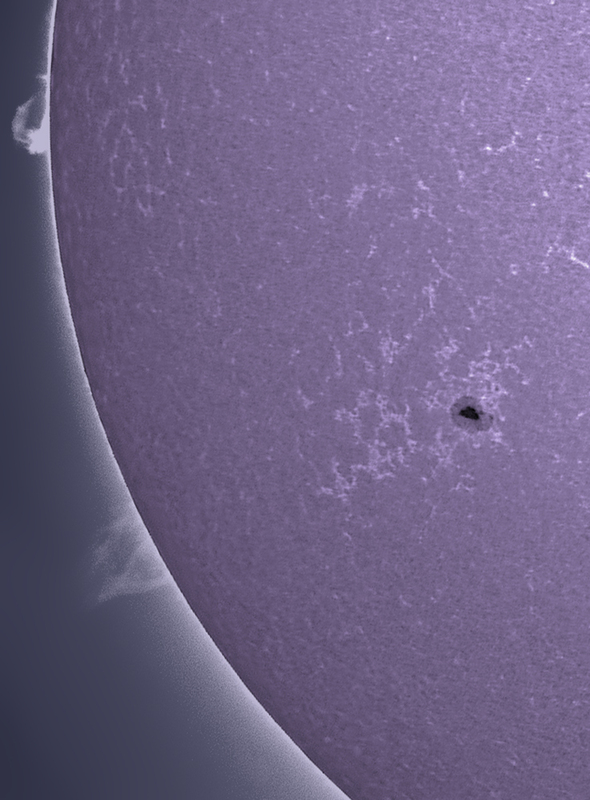 I was looking through some old images and thought there were some bright points lurking around a sunspot (AR 2158) in one of my Calcium K images. So I decided to reprocess the image and enhance lighter grey shades to try and bring out these features. 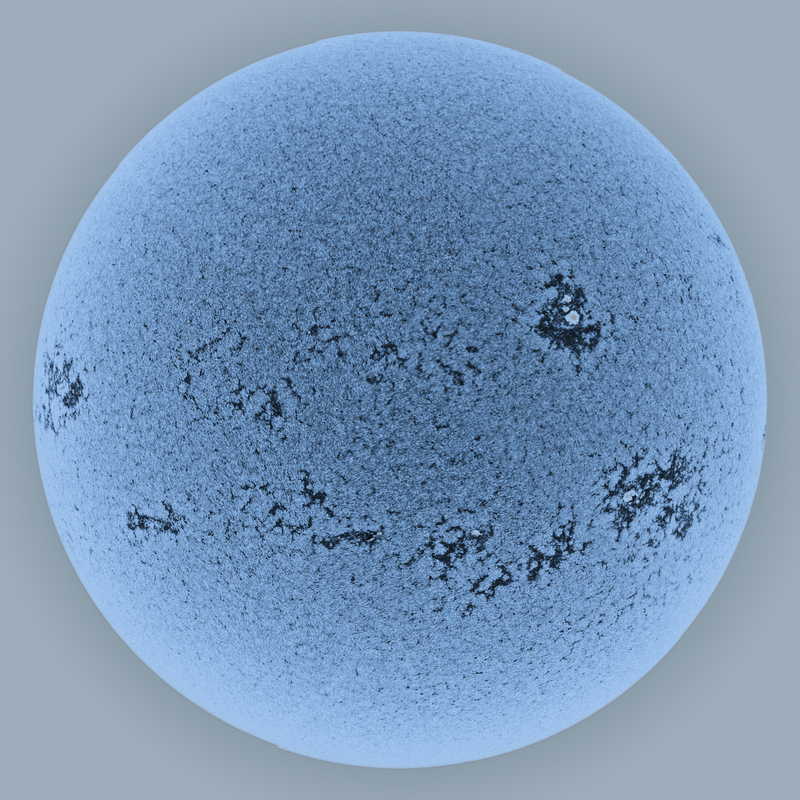 There’s not a lot out there about processing Calcium K images, so I include a screenshot of how I enhanced the image in Registax 6. 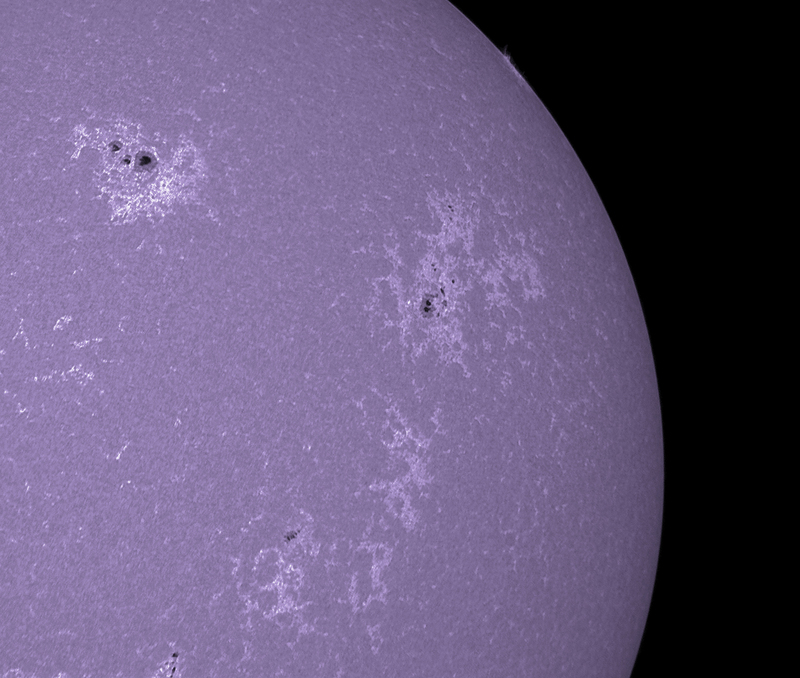 When this was completed, I could see a lot of small, intense white spots around the sunspot. I wasn’t sure what these were so I asked on the Imaging Solar section of “Stargazers Lounge” (http://stargazerslounge.com/forum/92-imaging-solar/), an online forum for astronomers. A very expert solar astronomer and winner of Astronomy Photographer of the Year for her solar photographs, Alexandra Hart (flickr feed here: https://www.flickr.com/photos/alexandra4), kindly told me that these are areas of intense magnetic fields where arch filaments rise up from the surface of the sun – these are known as arch filament foot points and correspond to the ends of long filaments seen on hydrogen alpha images. Occasionally, there can be magnetic reconnection of field lines that cause micro-flares – these also show up as bright white points but are transient over the course of 10 – 20 minutes. These were first spotted by an astronomer called Ellerman and he thought they resembled the atomic bombs that were being tested at that time. The only way to confirm if one of these bright spots is an Ellerman bomb is to do 2 runs about 20 minutes apart and see if any of the bright spots disappear or new spots appear for the 1st time. Those that remain unchanged are arch filament foot points and any transient spots are Ellerman bombs. I’m very pleased that I can I get to this level of detail in my Calcium K imaging and it is certainly very encouraging for me. At some stage, I want to start hydrogen alpha imaging but for now, I’m happy to improve the quality of my white light and calcium K images. 1000/102mm refractor, Lunt B1200 CaK module, Baader K line filter, Skyris 274m CCD camera, Astro Hutech solar guider, Ioptron ZEQ25GT mount.